Roasted bell peppers and ground bison combined with freshly baked buns for a memorable version of an America Classic. One of the challenges of living hundreds of miles beyond the road system is that we frequently can’t get the ingredients we want for cooking. With the school year rapidly drawing to a close (fewer than eight weeks remain now) and an abundance of ground bison in our freezer, Barbra had been requesting Sloppy Joes. “I’ll make the buns!” she promised. Problem is, the village store hasn’t had onions since early January. The last shipment was frozen solid and had to be tossed out. We’re out as well, and I couldn’t quite imagine Sloppy Joes without diced sweet onions mixed in with the meat and sauce. And then, out of the blue, a friend gave us two green bell peppers. Roasted and skin peeled, these would provide the tangy sweetness I was looking for. I had a large carrot in the fridge that needed to be used, so I diced and sautéed it and added it to the ingredients as well. Mixed together with an off-the-cuff sauce, our Bison Joe’s came out great – more savory than sloppy, and sweet enough to please the kid in us. Place a baking sheet (a good, thick one is best) into oven and preheat to 500 °F. Using a brush, spray bottle or fingers, thoroughly cover bell pepper halves with light olive oil, canola oil or other oil that will withstand high temperatures. Remove peppers from baking sheet, place in paper bag and close. This will help steam the skins loose. When cool enough to handle, peel off the skin. Dice the peppers (about 1/4″ pieces) and set aside. Add about 2 tablespoons olive oil to a large frying pan and heat over medium heat. Add ground bison. Breaking up the meat and stirring, cook until evenly browned. Pour out on paper towels to drain off oil and fat and set aside. Add about 1 tablespoon olive oil to a medium frying pan and heat over medium to medium-low heat. Add carrots, stirring frequently. Just before done, add the garlic and cook an additional 1 to 2 minutes. Place in a small bowl and set aside to cool. Add all ingredients to a non-reactive bowl and mix thoroughly. Add the garlic and carrots (above). Add the bell peppers. Add additional chili powder, cumin or Cholula for more of a kick. Place the browned bison in a large skillet. Heat on medium heat and add enough sauce to coat the meat. Beyond that, how much sauce to add is a matter of cook’s choice. Mix thoroughly, cooking and stirring till everything is hot. Serve on toasted buns or toasted bread with a frosty mug of root beer. Before these, I don’ t think I had a sloppy joe since I was a kid – too greasy. But now, I’d make them again. These were really good! I’ve often read on Bison and Buffalo meat and the properties of the meat/milk, dairy (cheeses etc) I love that you’ll do whatever is within your means to satisfy that craving! Even in sub zero and below temps! I’m yet to try a Sloppy Joe, heard about them of course! It definitely looks tasty! Thanks! Bison are grass fed, making their meat a fairly healthy choice. Way to make do with what you have and I bet the onions weren’t even missed. The sauce sounds amazing. Thanks for this post. I needed a gratitude kick in the pants today! Sometimes the fact that i can get almost any ingredient so easily escapes my notice. When I start to get a bad attitude posts like this remind me just how good I have it! We were surprised how sweet the the bell peppers were when we roasted them – totally took the place of the sweet onions. 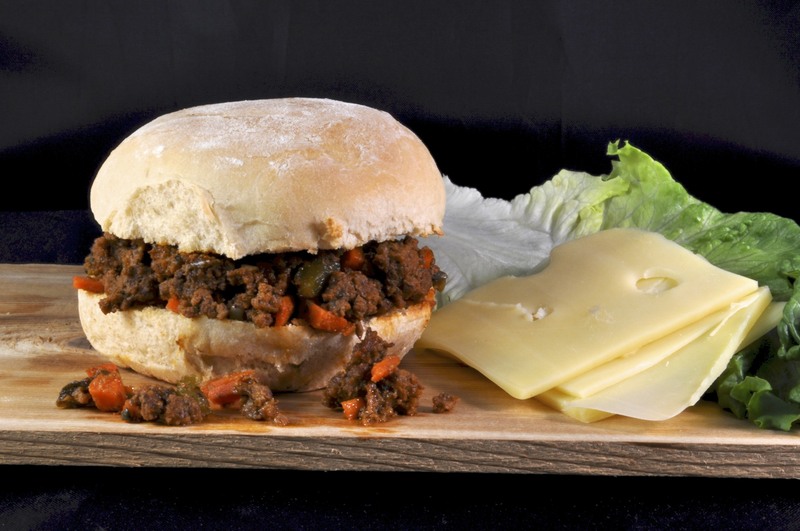 I’ve often wondered what a Sloppy Joe was – I might get to the market for some buffalo meat tomorrow and try my own! Tell us how they turn out. That does sound delicious! Next time I can get my hands on some bison, I will definitely try this. 🙂 Thanks for sharing! An all-American classic – never had it with bison though! My Japanese mother picked up a great number of recipes when living in the US Midwest and Sloppy Joes was one of them…I remember it fondly as a childhood treat! These aren’t as sweet as the ones most of us ate as kids – or as sloppy. But they sure hit the spot! They were especially good with a slice of Swiss cheese. This is on my “to try” list with ground black bear meat. Man, that sounds like a great idea!